As America’s second oldest franchise organization, Arthur Murray is known around the world as a prominent entertainment company with franchises located throughout the United States, Canada, Puerto Rico, Europe, the Middle – East, Japan, Africa and Australia. Prior to World War II, Arthur Murray teachers were a regular part of every first–class steamship cruise and during the Thirties, the studios introduced such dances to the public as the “Lambeth Walk” and “The Big Apple.” In fact, it was “The Big Apple” that launched Mr Murray’s one studio into one of the largest chain of dance schools, and this occurred in Minneapolis, Minnesota. In 1942, singer Betty Hutton with the Jimmy Dorsey Orchestra recorded the big hit song “Arthur Murray Taught Me Dancing In A Hurry” for the movie “The Fleet’s In”, and by 1946 there were 72 Arthur Murray dance studios across America. Arthur Murray was the first to realize the growing popularity of Latin dances in America during the 1950s. Many conventions were held in Cuba during that time to give Arthur Murray dance trainers first–hand knowledge of the hot new Latin styles and moves that were in vogue and becoming popular. In July 1950, Mr Murray purchased five 15–minute television spots on CBS and persuaded his wife Kathryn to do the teaching. Before the third show, Arthur bought a half-hour summer series on ABC. The show was called the “Arthur Murray Dance Party.” By May 1952, the Murrays had televised almost 100 programs. Their TV ratings climbed and in the summer of 1952, they signed with their first sponsor, General Foods. Millions of viewers all over the United States fell in love with the show, and flocked to the Arthur Murray studios throughout the country. This highly popular show ran for twelve years on national television. When Arthur and Kathryn Murray retired in 1964, a group of franchisees purchased the company and brought a fresh new spirit and leadership to it. 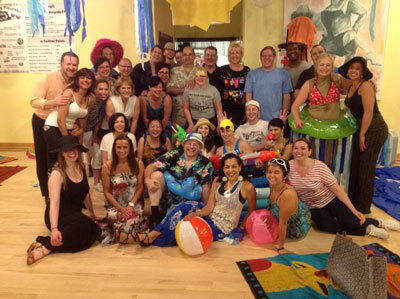 Under its new leadership, the Arthur Murray franchised dance studios have kept pace with the rapidly changing “youth culture” and continue to flourish as the world’s largest dance instruction organization. Arthur Murray dance teachers can be found not only in the studios, but on the movies sets in Hollywood, backstage on Broadway and in partnership with major entertainers to promote the music that the world dances to. Whenever a movie involves dance, it’s good bet that Arthur Murray has been involved in some way, shape or form. Such movies as Dirty Dancing, Dirty Dancing II, Dance with Me, Beautician and the Beast, Flash Dance, An American President, True Lies, Saturday Night Fever and Scent of a Woman are some of the films which have used Arthur Murray instructors to either teach a dance to the stars and/or dance in the film. The Arthur Murray franchised dance studios’ names appear regularly in major national magazines that include Vogue, Martha Stewart Wedding, Smithsonian, Sport Illustrated, Woman’s Day and more. Wherever advertisers want to reach consumers with a message of romance, intimacy or just plain fun, you’ll see dancing, from the Gap’s now famous Khaki Swing commercials to dancing M&M’s and gas pumps. Arthur Murray’s commitment to dance goes even further, with senior management heavily involved in the world of professional and amateur competitive dance, known as DanceSport. Many of Arthur Murray’s officials have contributed to bringing competitive ballroom to the forefront as an Olympic Sport. All the Arthur Murray franchised dance studios are independently owned and operated by individuals who started as dance instructors and worked their way up to the executive level. By the time they are qualified to purchase a franchise, they have experienced every phase of studio operations, from teaching and supervising to marketing and managing. It is possible for an ambitious person to advance to a top executive job and become eligible to be a franchisee within just a few years. Building from within has kept the studio system strong, with franchisees that are committed to the Spirit of Excellence which is the hallmark of the entire Arthur Murray system. Currently there are approximately 280 Arthur Murray franchised dance studios worldwide.